Every winter I feel like I need a new jacket. I have started a huge collection, but living in Chicago, it's nice to have a few different options besides my over-kill down puffy jacket. 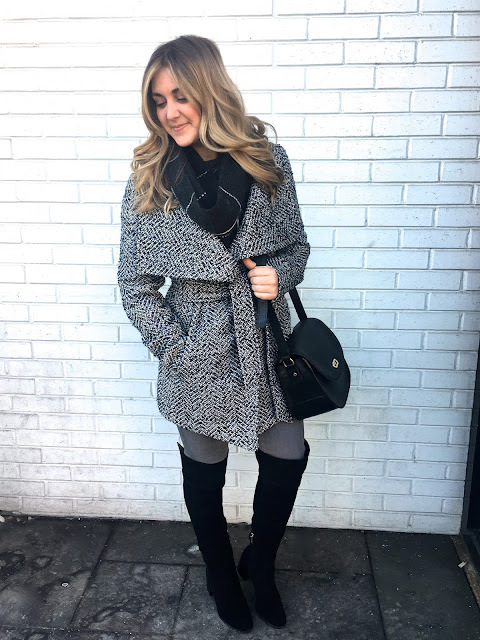 I love belted coats, and although I have my wool Tahari wrap coat (see it here), I couldn't resist passing up this tweed pattern. 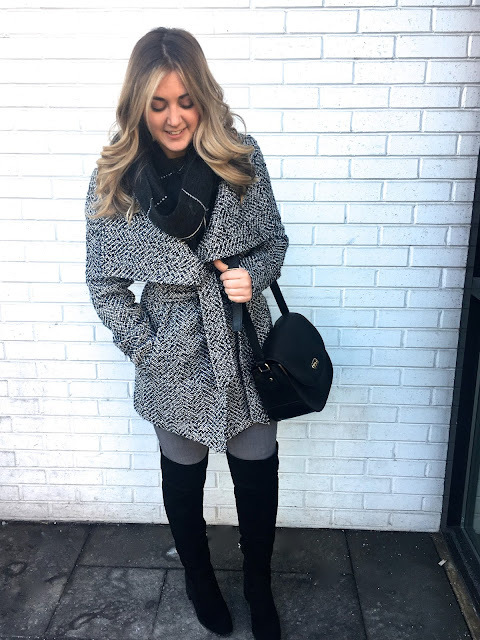 This Belted Tweed Coat is perfect for those snowy days as it helps keep out the wet and cold. I love pairing it with my high knee suede boots for extra warmth. Yesterday the news said Chicago was colder than Mars (eye roll) and truth or not, I'm super happy I purchased this for the weather. I'm a huge fan of mixing patterns, so when I found this check line scarf on sale at Nordstrom, I knew it'd be the perfect counterpart. Although it's sadly currently sold out, you can find a similar one here. The cold makes me turn do grey and black colors, however I'm trying to break that and incorporate more muted and deeper color tones so that I'm not always looking so dreary. Side note: If you're wondering why my hair looks a little darker, it's because it is! I decided for winter I needed a refresh since my hair was starting to get too blonde. I saw Mindy at the Bristle + Grace Salon who took on the task of a complete revamp of my hair and totally killed it. I went from back to back blonde foil hight lights to a root drop (hence the dark) and blonde balayage. I was so impressed with her color abilities and couldn't love my hair more. If you're in need of a little hair transformation I totally recommend her and tell her I sent you!